Seriously? OMG! 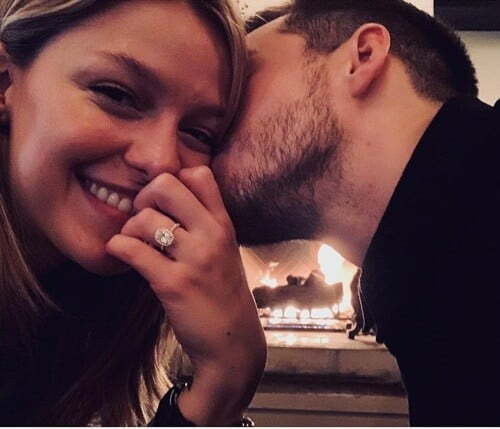 WTF?Melissa Benoist is engaged to another co-star - Seriously? OMG! WTF? February 12th, 2019 under Engaged? Back when Melissa Benoist was on Glee, she met Blake Jenner and the two of them got married. Then in 2017, they got divorced and she started dating her Supergirl co-star Chris Wood. On Sunday, she posted the above photo and said, “yes yes yes it will always be yes♥️.” While he posted another photo of the newly betrothed couple and said that their wedding “will be soon”. Hopefully, their marriage will last through her next show and beyond. What you were thinking the same thing? Luckily, The CW superhero show was picked up for another season, so they will get at least one good year in. Sincerely, I am thrilled for them because they look so happy!